It'll Blow Your Mind and That's a Fact." Casey Carle, Comic Bubble Artist! 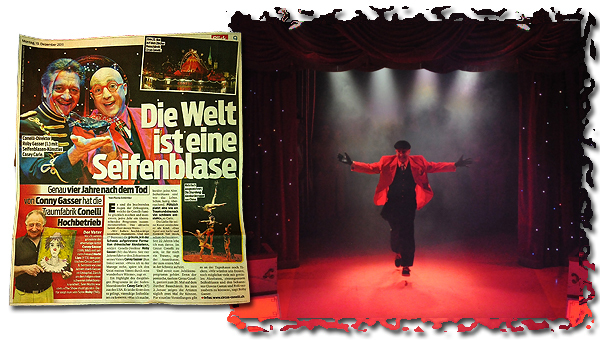 - Circus & Variety Shows! Precision skill combined with humor, snappy music and classy costuming makes this act as appealing to the veteran audience member as to children of all ages. Recognized for outstanding achievement at The World Circus Festival in St. Petersburg, Russia and receiving rave reviews as the pivotal Closing Act to the famous Circus Conelli in Zurich, Switzerland, Mr. Carle has clearly found a way to bring soap bubble entertainment and excitement to circus and variety arts fans world-wide. "An absolute highlight of the show and easy to work with. A real pro!" Casey Carle, Comic Bubble Artist, began his bubbly career with The Ringling Bros Circus in 1988, by being the first entertainer in circus history to create giant bubbles and to encase an audience member inside a soap bubble. Over two decades later, and with thousands of full length stage shows under his belt, Mr. Carle has returned to his roots by developing a crowd pleasing bubble act that is ideal for one-ring circuses and variety shows around the globe.